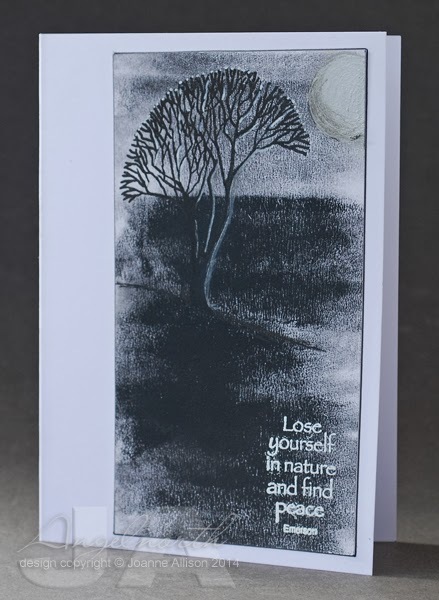 Lydia has set this week's Mixability challenge at Splitcoast Stampers - Through the Mist. The idea is to clean a painty brayer by rolling on clean cardstock and use the resulting piece as the basis for something. The brayered prints are often reminiscent of a misty landscape. Lydia's put together a great little video, you can check it out of the SCS thread linked above. When I watched the video, I kept mentally filling in bare tree shapes on the prints so that's where mine had to go, I'm afraid! I stamped the tree over the brayered base and added a bit of white pen for some moonlight highlights. I smudged a little charcoal pencil along some of those higlights to soften them. I helped the brayering along just a tiny bit with a pen line under the tree to define the ground a bit more and stamped and white embossed the sentiment. The moon is finger-painted with silver acrylic paint and I added some lowlights with a Copic fine liner once the paint was dry (again smudging with my finger). I kept the setting really simple, just sticking it slightly offset on the cardbase and running the fineliner round the edge of the panel - I thought the simplicity went with the tranquil feel. Bright white embossing powder by WOW! This is about as close as I'm likely to get to shabby chic and it just kind of evolved that way. I made the embellishment and then had no end of trouble figuring out how to use it! 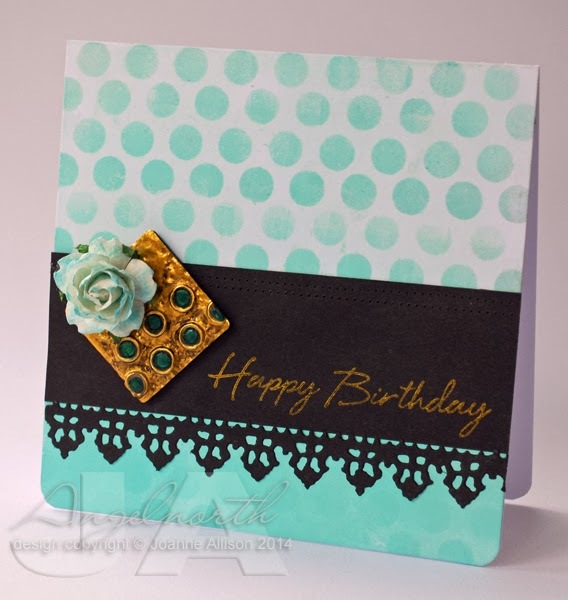 If you choose to play along with the DT on the Pan Pastels challenge blog this week, the challenge is to use a stencil to create an embellishment (details here). It sounded like a challenging challenge and I'm up for that so I had a go! I used a piece of metal from a tomato paste tube, cut with a Cuttlebug die (it started life as a tag but I snipped off the hanging loop as part of the evolution process!). On the back, I drew inside the circles of a sequin waste mask with a knitting needle, flipped it over and squashed the centres of the raised circles and refined it (again with the knitting needle!) to give a sort of rim. The whole lot is stuck to a piece of mount board and bashed with an embossing stylus for a beaten metal look. I used a bit of Copic ink to colour the centres of the circles and a dot of Glossy Accents for an enamelled finish. So far, so good - I liked the way it turned out. Then I faffed for a couple of days and nothing looked right. I eventually ended up with this and I'm still not entirely happy but I decided to say enough is enough and call it done! I used Versamark through the same sequin mask and added Pan Pastel on the card front. Then I added more Versmark and more pastel at the bottom for more solid coverage. The rose has some turquoise Pan Pastel brushed over the edges. 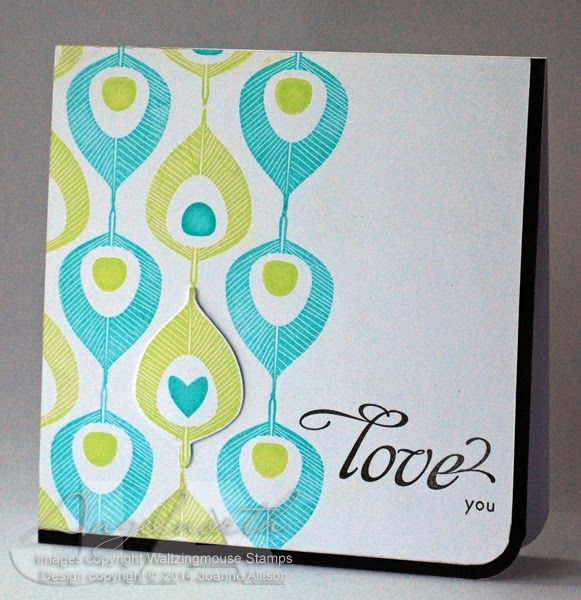 It's time for a new Take It, Make It challenge on the Craft Stamper blog and this time it's all about repeats! Take a stamp and use it several times over to make your design - it could be a background, a focal point or whatever you can dream up! I chose a stylised peacock feather for a lovey-dovey card that could be used for those tricky occasions when hearts and flowers don't seem quite right! The little motif in the centre of the feathers is a separate stamp so I used the "eye" in most and a single heart to go with the love theme. I cut out the feather with the heart and used silicone glue to give it just a tiny bit of height to accentuate it, just sticking it over the one stamped on the base layer. This is one of those occasions where I'm pleased I have both sizes of Corner Chomper even though it does seem extravagent! Being able to round that corner and have the white layer "nested" with the black border makes me happier than it should! Check out the blog for details if you fancy joining the challenge - we'd love to see you and there's a prize of a couple of lovely stamps from Visible Image as well as the chance to see your card published in the magazine if you're the winner! The challenge is going monthly from March so if you've been used to a two month slot to join in with us, remember you need to get your skates on this time - closing date is midnight on 26th February! I had a little play with various bits and pieces today. 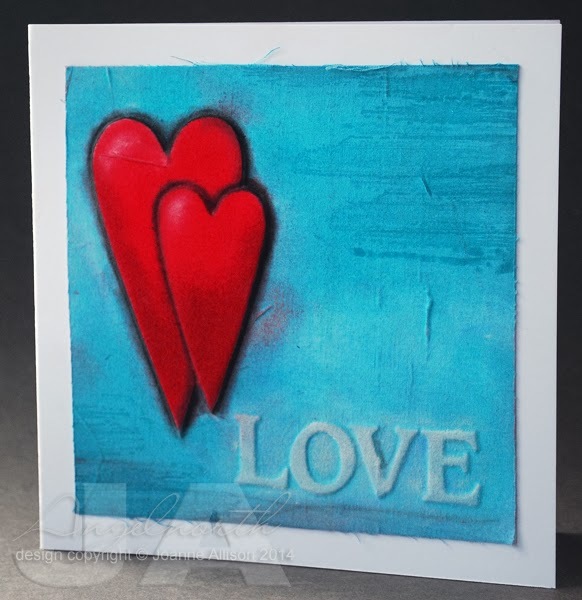 This week's MixAbility challenge at Splitcoast Stampers calls for the use of hearts (here) and the Pan Pastels challenge blog has another anything goes week with the option to join the DT in using fabric on your project (details here). Very little stamping on here and more die cuts than I'd usually use! 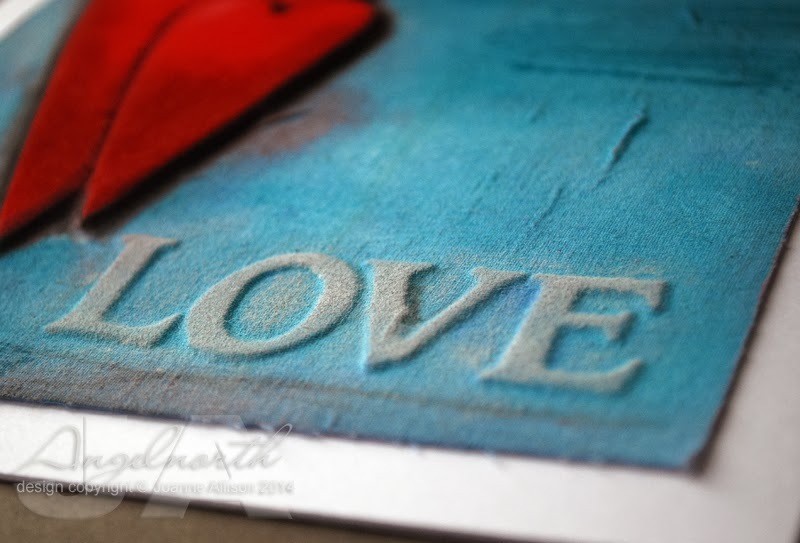 I started with two primitive hearts cut from mount board and lettering to spell the word LOVE (I cut the word twice and stacked the layers for a bit extra depth since Spellbinder dies don't cut thick materials). Then I covered the lot with double sided tape sheet and put fine-weave cotton fabric over it. I ran it through my Big shot with an embossing mat to make sure everything was stuck down well. I'd have liked a few more wrinkles in the fabric but never mind, the texture is still interesting! Then I went to town with Pan Pastels and a charcoal pencil. The only stamping is some Hero Arts brush strokes stamped in the corners in Versamark and rubbed over with more pastel for slightly more intense colour. I left the edges of the fabric deliberately a bit frayed before sticking it to a card base. I used my finger to apply the white Pan Pastel over the lettering as it seemed to give me most control. What I learned - Mod Podge doesn't take Pan Pastel very well (I originally Mod Podged the fabric rather than using sheet adhesive); I love the look of fabric over die cuts; you need to make sure there's a support under the overhang of the second die cut to bring it to the same level as the other one before running it through the Big Shot. I'm also extremely pleased with my new fixative - it's a natural substance (based on casein, the protein found in milk and apparently the fixative preferred by Degas!) and it's in a pump bottle so there's no solvent smell or hazard if you're spraying indoors. The weather is so awful here in the UK at the moment that I thought a bit of brightness might be in order in the craft room! 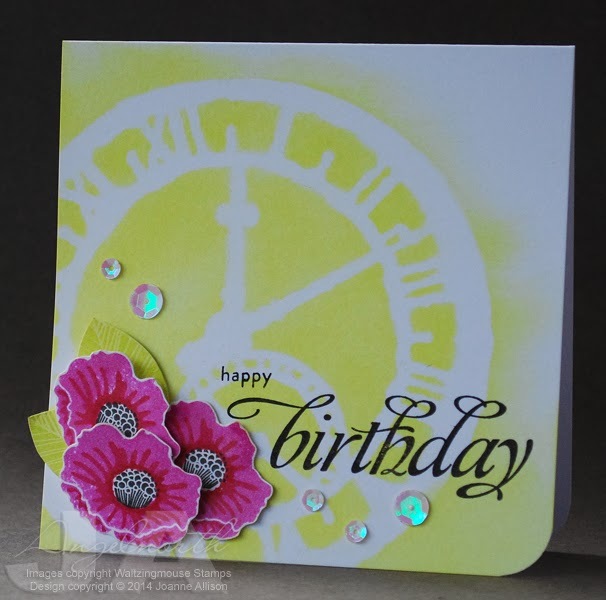 I've just treated myself to a few new colours of Pan Pastels too so I chose the Bright Yellow Green and made a cheerful birthday card for my stash. 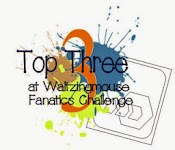 The Pan Pastels blog has another "anything goes" challenge with the option to join in with the DT in using a stencil (details here). I've actually used a mask but the terms seem to be somewhat interchangeable these days so I'm going to count it as playing along with the theme! I loved how easy it was to feather out the edge of the pastel - quicker and easier than ink and sponge! The pretty flowers are really quick and easy to do - they're a two step stamp and as they're clear, it's really easy to line up the various layers. I fussy cut by hand but Claire does have cut files available for this set if you have an electronic cutter and prefer to leave the scissors in the drawer! The sequins are irridescent white and at certain angles they're almost exactly the same pink as the flowers! Thanks for stopping by - hope you're staying safe and dry if you're dealing with extreme weather!